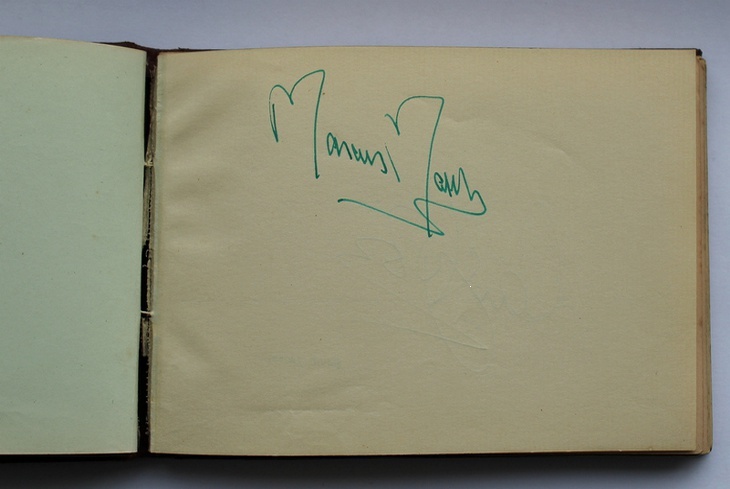 In 1955 one of my Christmas presents was an autograph book. I immediately set out to fill it with as many Dan Dare and Eagle related autographs as I could muster. As can be seen below, I managed to obtain many signatures including those of Marcus Morris, Chad Varah, Alan Stranks (the scriptwriter), Sir Hubert Guest (who was masquerading as my grandfather) together with various visiting film makers and crew, including the now famous director Nicolas Roeg - and of course, most of the Dan Dare artists. Star prize here definitely went to Eric Eden for his wonderful rocket.